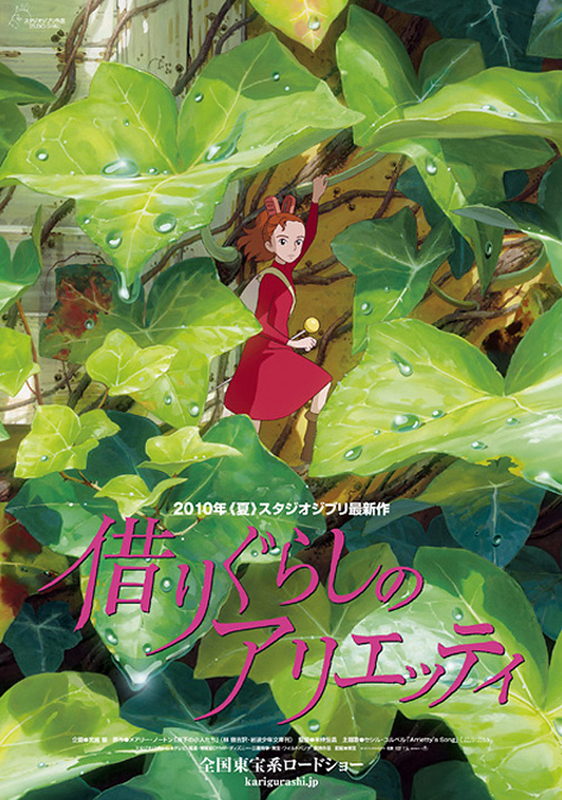 Based on the book The Borrowers of the Western Author Mary Norton, Arrietty (2011) is Studio Ghibli's latest animated masterpiece which is the pinnacle of Japanese animation. Miyazaki, the co-founder of Studio Ghibli, who is probably the most celebrated Japanese film-maker, has given the directory role to one of of the studios animators Hiromasa Yonebayashi. Although it lacks in great visuals, which Miyazaki's films is full of, this is a great tale about small people with big ideas. Arrietty tells the story of a race of very small people, The Borrowers who live under the floors and in the walls of houses and survive on what the human world has to offer them. 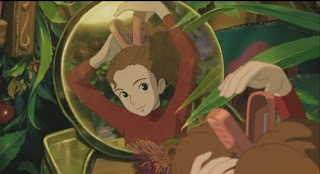 The main character of the story is Arrietty, a young borrower who has just started her borrowing training and is full of energy to explore the big world of humans. What the film succeeds in is portraying the world from a borrower's point of view where a quiet suburbian house turns into an enormous landscape, cats are threatening monsters and humans are some sort of gods who can destroy them and their home at their own will. Like Jim Tudor describes: "In this borrowed concept, we once again have a major Miyazaki theme about the raw and scary reality of the larger, often unseen world just beyond our own comfortable confines." (Tudor.2012). Looking through the eyes of such small creatures the film has the finest attention to detail, and turn the most mundane, every day things in life, like the cracks on the walls, the veins on leaves and fabric into works of art. Those are facets that other studios tend to skip to get into more 'exciting' parts, but Arrietty succeeds in taking its time to observe the little things that go unnoticed. Miyazaki's films are family friendly, with respect to its younger audiences. Arrietty has no deep meaning to it but according to Eisenberg: "The Secret World of Arrietty plays as a beautiful fairy tale that doesn’t dwell in deeper meanings and metaphors, but is rather just a lovely piece of magical realism. But while some may see this lack of real depth as a negative, it does something that’s actually quite a bit more impressive: it treats even its youngest viewers as adults." (Eisenberg). Even though it might seem like a kid's story it actually reaches subjects such as illnesses, which one of the character's suffers from. This gives the opportunity to small children to discuss heavy subjects like these without scaring them but giving them an overview of the adult world, where realism takes its place and leaves childhood care freeness behind. In conclusion, Arrietty is a slow pace film which is not afraid to take its time to make us observe and admire the little things in life. It is a heart warming fairy tale, with a very strong sense of colour and symbolism, detailed animation and lovable characters. It will certainly make you smile.